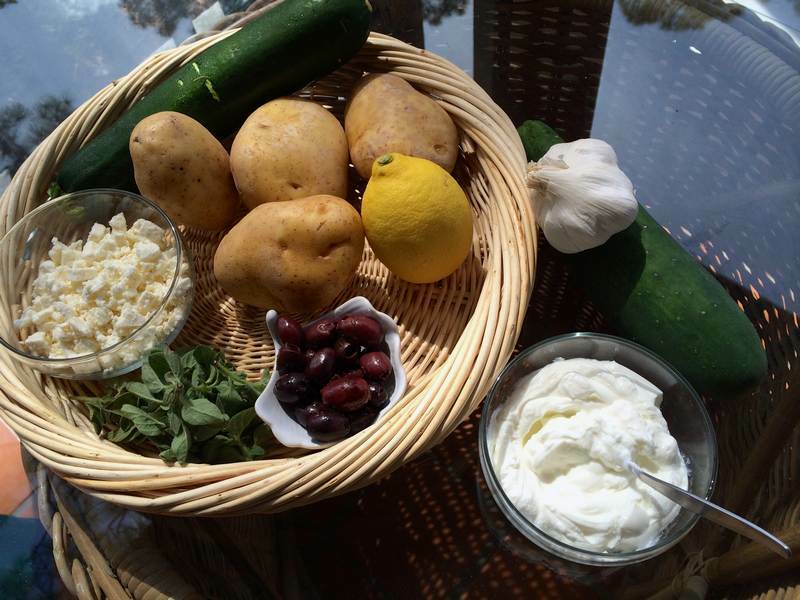 Greek Potatoes with Tsadziki – Efkharisto! Are you a social network junkie? Do you have IAD or Internet Addiction Disorder? According to one definition, you do if you’ve tried to cut back on your internet usage—and couldn’t. Why do we get addicted? Some think it’s because the instant stimulation provided by our digital devices leads to the release of dopamine, a chemical central to the brain’s reward system. Recent studies reveal that we no longer concentrate, analyze and think creatively the way we used to in the pre-internet era. However, other studies show that middle and older-aged folks benefit from the cognitive stimulation they get from being online. You can take an Internet Addiction Test to find out if you have a problem. Now prepare this recipe for Greek Potatoes with Tsadziki while sharing it on FB and Pinterest and dancing along with the spectacular Greek live music video above. Here’s how to spiralize vegetables without a spiralizer. Preheat oven to 400F. 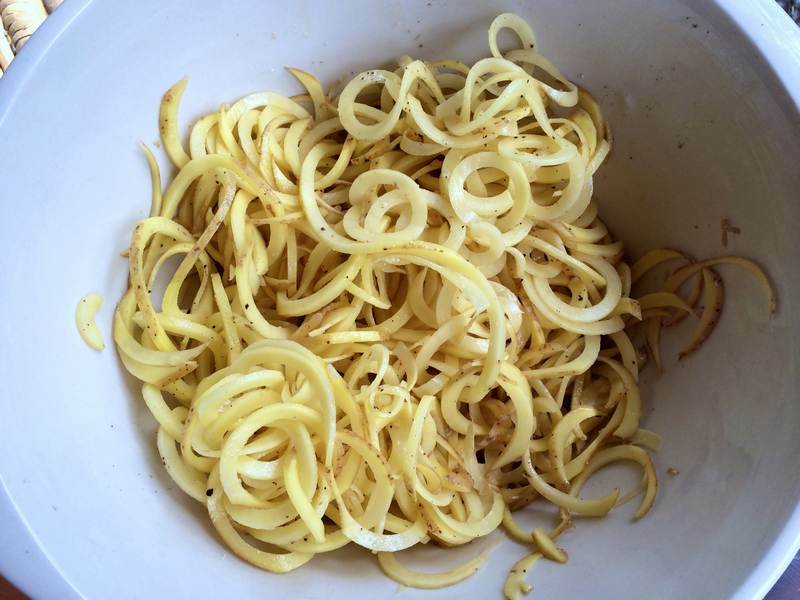 Use a large noodle blade (1/4-inch spacing) on a Spiralizer to cut the potatoes. Mix them with a tablespoon of olive oil and season with salt and pepper. Coat a baking pan with parchment paper and spread out the potatoes. Roast or bake for about 20 minutes, turning occasionally, until done. 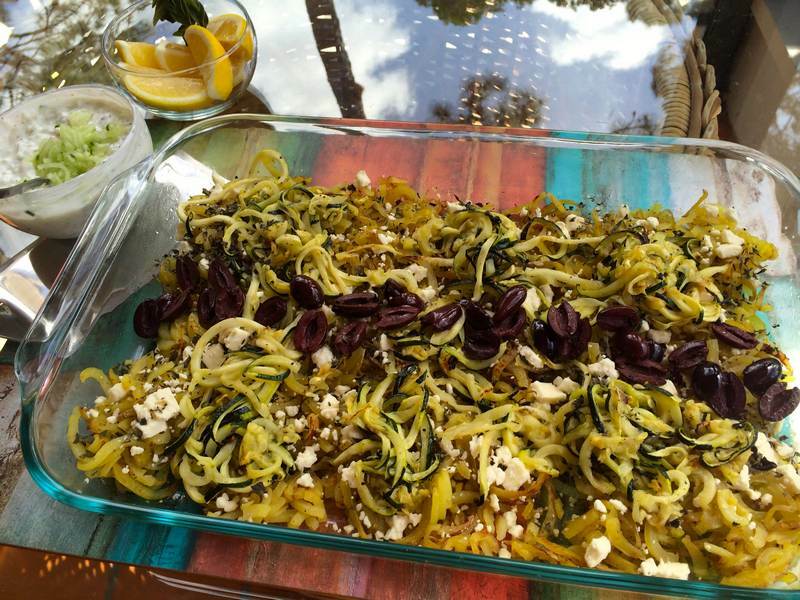 Use the large noodle blade on the Spiralizer to cut the zucchini. Coat the zucchini with 2 teaspoons of olive oil and season with salt and pepper. Coat a baking pan with parchment paper and spread out the zucchini. Roast or bake for about 15 minutes, turning occasionally, until done. Brush a little olive oil in a large Pyrex dish. Spread the cooked potato out on the bottom. Sprinkle on the feta and oregano. Place the zucchini on top. Distribute olives as garnish. Heat for 10 minutes before serving. Serve hot from the oven with the Tsadziki and lemon wedges on the side. Serves 4. Marries well with all kinds of dishes. Makes a perfect light lunch alongside plain scrambled eggs. Use the small noodle blade (1/8-inch spacing) on the Spiralizer to cut the cucumber, then chop it and add it to the yogurt along with the other ingredients, reserving a spoonful to use as garnish. Adjust the seasoning to your taste. Maybe you live in NY or maybe you just like to visit there. Either way, wouldn’t you like to know where to go for the best brunch in NYC? Are you searching for information on the truth about GMOs? Do you know the best way to store lemons to keep them as long as a month? I got 31% and I won’t buy you a diamond to celebrate, just a lettuce spinner. Thanks for sharing George. I don’t need a lettuce spinner, but maybe you can share a favourite recipe? I scored 49. Top score you can have to still be considered normal. Phew! Now if I could just convince Marvin. Great idea for a salad. I like the combination of ingredients. Yes, the spiralizer is great for making salad. Thanks for liking the ingredient combo. I’ve stopped checking to see if my ideas are original. I guess that means I’m a tad less jittery! Thanks! Paderno is the make I’m using and it seems quite sturdy. It’s a strange combo but it works.